Yes, our PGR Pets competition is essentially just an excuse to celebrate the furry (or scaly) friends that help you take a break from your research routine, or even just help you smile when you’re having a particularly frustrating day. The animal in question can be a cat, dog, fish, iguana — even a squirrel that you always see on your walk into the lab/office. If it belongs to somebody else, though, please make sure that you have their permission to share the photo. by emailing it to doctoral-college@bristol.ac.uk. The closing date for entries is 5pm on Friday 8 February 2019. If a photograph features a domestic animal that isn’t yours, please ensure you have the owner’s permission to enter. The Bristol Doctoral College may share images from the competition in a future blogpost and on social media. Note: although we thought this was an original idea, we must credit the University of Glasgow’s PGR Service, who got there before us. Read their PGR Pets and self-care blogpost. Where has your research taken you this summer? Featured images: Lake Superior by Andrea Iannelli; Honolulu by Fiona Belbin; Melbourne by Kacper Sokol; Montmorency Falls by Lin Ma; Patagonia by Sarah Tingey. We know that the summer months can be busy for Bristol’s postgraduate researchers, and that many of you use the time to travel overseas for conferences, symposia, field work, and so on. We thought it’d be fun, then, to launch a photo challenge with a travel twist. Yes, our #PGRtrek competition is back for 2018 — and, this time around, the postgraduate researcher who’s been to the farthest-flung location (for ‘business’ reasons rather than pleasure) will win a £50 contribution towards the cost of any research-related travel. We’ll also be offering another £50 contribution to a random draw from all other entrants to the challenge. 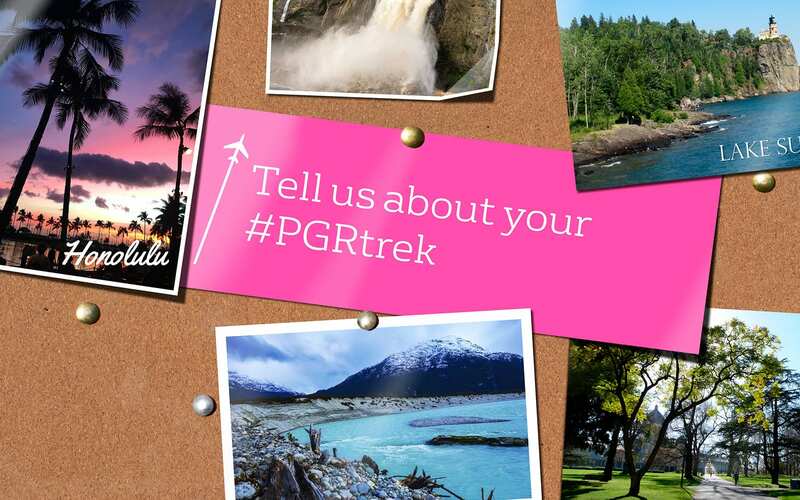 We’ll be sharing a #PGRtrek gallery on the blog later in the year, so please let us know if you don’t want your picture to be featured. The closing date for the competition is noon on Friday 31 August. Good luck — and happy snapping! The competition is open to current postgraduate research students at the University of Bristol. The closing date for entries is 12pm on Friday 31 August 2018. The prize is £50 towards the cost of any research-related travel. The prize will be awarded via a transfer of funds or a reimbursement of expenses. The prize will be awarded to the entrant whose research-related activity was the furthest Bristol. The activity in question must have taken place between 1 June and 31 August 2018. Unless entrants indicate otherwise, images submitted during the competition will be featured on the Bristol Doctoral College blog. Bristol’s postgraduate researchers travel far and wide during the summer months — so we thought it’d be fun (and informative) for us to map your globetrotting and share some snaps from your sojourns. To make our ‘PGR trek’ challenge even more interesting, the researcher who’s been to the farthest-flung location (for ‘business’ reasons rather than pleasure) will win a University of Bristol scarf! To enter our competition — and see your pin on our map — tell us where you went via Twitter/Instagram using #PGRtrek or send the details by email to robert.doherty@bristol.ac.uk. Photos of your trip are very welcome, but please let us know if you don’t want these to be used on the BDC blog. The winners will be unveiled on Friday 15 September. Good luck!